IM BACK!! Sorry i’ve been a little MIA on the blog lately. Life has been busy over here at the Dyer house. Cayman was potty training all week, and is finally 100% potty trained! Props to all you moms who have done it before with boys. It’s HARD work!!! Not to mention, Beckham came down with a nasty bug this week and didn’t sleep for 4 days straight. I’m happy to report he slept 8 hours last night. Hallelujah! Now, on to the good stuff! How much do we love the gold trend we are seeing so much of lately? It’s everywhere, and im a big fan. I’ve always loved gold since I can remember, so this trend is right up my alley. 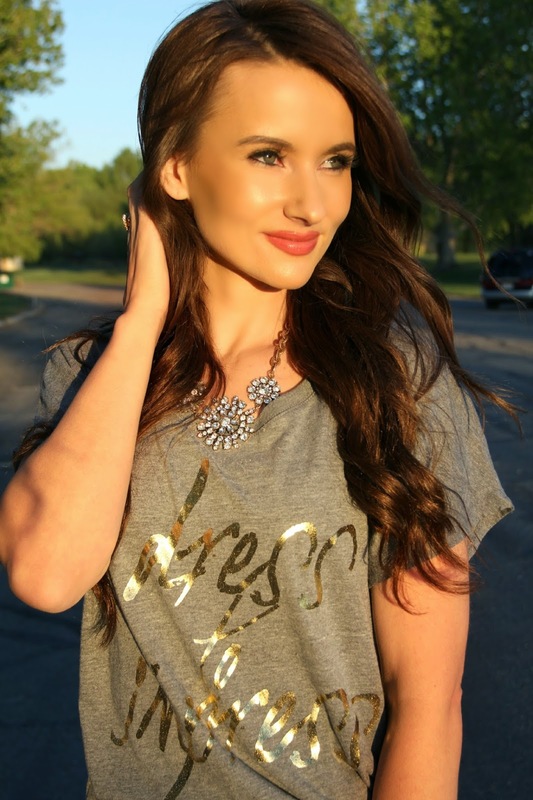 I’m in love with this gold metallic “dress to impress” top from foi clothing. It’s a flowy fit, which I absolutely love. Sometimes its hard for me to find the perfect fit top, but this top is soft and fits like a dream. Not too baggy, but loose enough that i’m not sucking my gut in every time I lean over to grab something. 😉 Plus, how perfect does it go with this adorable clutch? Black and white striped with metallic gold? Gah!! I had to have it! Now the tricky part, what was I going to wear with my new top and clutch? I wanted something stunning, and that made a statement. I just couldn’t get this gold sequin skirt out of my head from Provo Fashion Week by aBree Original. The skirt speaks for itself. Bree designs the most GORGEOUS clothes you will ever see, and is a fellow gold lover like myself. You all need to follow this gorgeous girl, she’s not only beautiful on the outside, but inside as well. Follow her on instagram here and fashion blog here. Thanks so much Bree for making this outfit absolutely perfect! What a beautiful look on you. I love it. That skirt is gorgeous on you! I love how you've styled it. Perfection! You look fabulous! 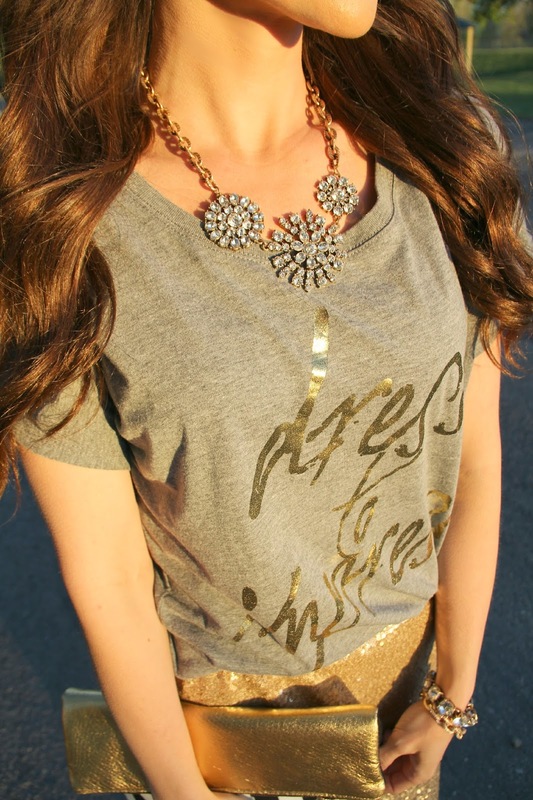 I love the contrast of that stunning gold shirt with a graphic tee! very cute high / low mix! love that sparkly skirt! What a gorgeous outfit! I love that tee! I love how you styled such a dressy skirt with a tee. You look beautiful! Gorgeous! 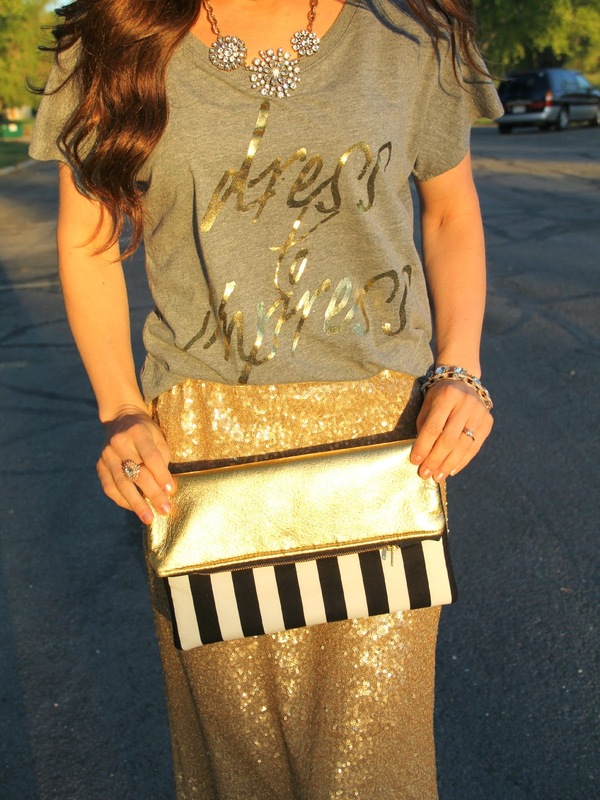 Love the sequin skirt and t-shirt combo. Such a fun outfit!! I of course love all the gold sparkle. So pretty. Love how you dressed it down with the perfect t-shirt. That skirt is seriously amazing! It would be awesome to wear for a big night out or a fancy event! That skirt is FANTASTIC! I love how you styled it too! That skirt is incredible! Beautiful photos, too. مركز صيانة معتمد من صيانة يونيون اير باقل الاسعار واعلى خدمة ممتازة باقل التكاليف ..
باقل التكاليف كما لدينا حملات صيانة في جميع انحاء الجمهورية ..